Shaw, Finch, and Arthur are rescued by Root. 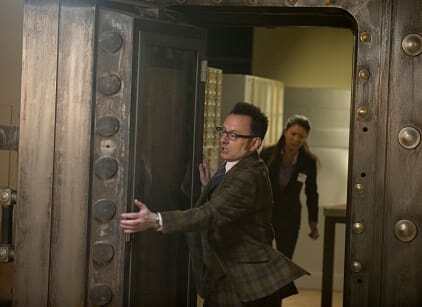 While escaping, Root is captured. Root is interrogated by Control for the location of the Machine. After Control takes one of Root’s ears, the Machine interrogates Control through Root. Arthur leads Shaw and Finch to a bank for the Samaritan drives. Both Vigilance and the government, led by Agent Hersh, want the drives. Finch thinks the drives are destroyed, but they are taken. Fusco convinces Reese to keep fighting, living, despite Carter’s death. The two rescue Finch, Shaw, and Arthur. Hersh is potentially killed by a member of Vigilance. Flashbacks reveal Finch putting his father in a nursing home. The Samaritan drives are handed over to Greer of Decima.